We have a chive plant that grows in a sunny and well watered nook at the front of our house alongside some purple speedwell. Every Winter the declines and every Spring it returns, nourished by the overflow from the gutter over the front door. It thrives so much that last year when the flowers died off the seeds spread. There are now baby chive plants flourishing in the raised beds. This year I don’t want to let the flowers dry out and spread the tiny black seeds. I want to make the most of their distinctive flavour and preserve them by making chive flower vinegar. To make chive flower vinegar is ridiculously easy and so I can’t really call it a recipe. You can see here I used a small glass jar. I jammed it full with about 10 chive heads that were just past their prime, then poured white wine vinegar over the top. Cover and leave the infusion in a cool dry place for at least a week. After the vinegar has stood for a this time, the chive flowers become pickled and on their own add a fantastic zing to a salad. The flowers won’t last more than 3 weeks here but the rosy-tinged vinegar will so I’ll add it to my salad dressings for far longer. 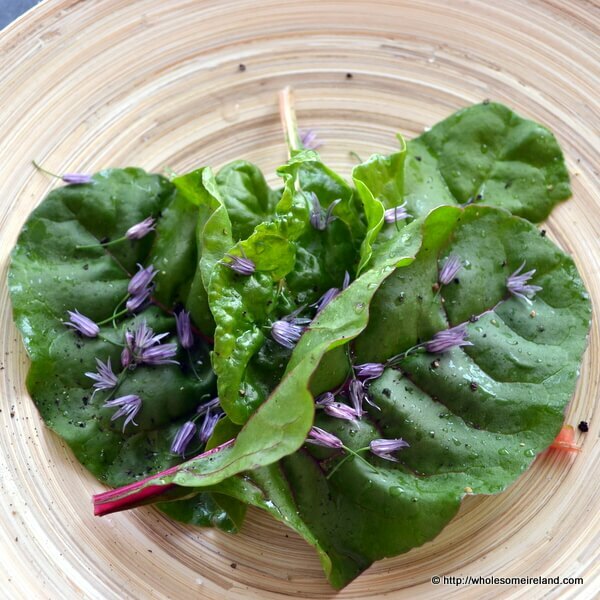 Yesterday I added some separated pickled chive flowers to a few pieces of baby rainbow chard, sprinkled some salt and cracked black pepper on top and had a beautiful, light green salad. I love this idea: thank you! Ah I hope you try it out Eugenie. It’s fab! Our community garden has some flowers that they can spare and I am so doing this!!! Brilliant. If they’re going to spare there is no harm is giving it a go! Oh that sounds so pretty! That is very true. I’ll be straining out the flowers next week. There is a beautiful blush hue on the vinegar at this stage. Don’t think it’s going to last very long! Oh brilliant. Great pictures too! I’m glad you enjoyed it. Ah well, maybe next year!